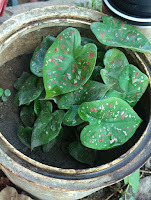 I (Beckie) had a plant in an old paint can, while I was away, there was this hard, long dry season. When we came back to Soroti there was only hard, dry dirt remaining in the pot, not a leaf to be seen, let alone a green one. So I thought to myself, let me start watering this dirt to make it soft again and then I can plant something else in it. About a week after I started watering, I saw something trying to peak out, it looked like maybe there was still something there yet. So instead of planting something else I just kept watering. Slowly by slowly, the leaves came back, beautiful leaves, green with splashes of white and pink and red, so full of life, so full in fact that I’ve transplanted them to an even bigger pot. And our good Father knew enough that I needed that message and He chose that plant that was right outside my door, so every time I go in or out I am reminded of His sweet message, “I am in the business of bringing things back to life.” I share this with you because maybe you are feeling the same, maybe there is something you thought was dead, a dream, a marriage, a business, a friendship, but maybe, there is still life there, and it could just need a little watering, or a little sunshine. A little time in prayer and in the Word. Our Father is an expert in raising from the dead, just talk to Him about it. Last week we went to check on all of our students in the sponsorship program to make sure they are attending school and to pay their fees. I was able to share briefly with one class as we visited the students. They were so excited to hear from us and have also requested a purity club to come to their school. 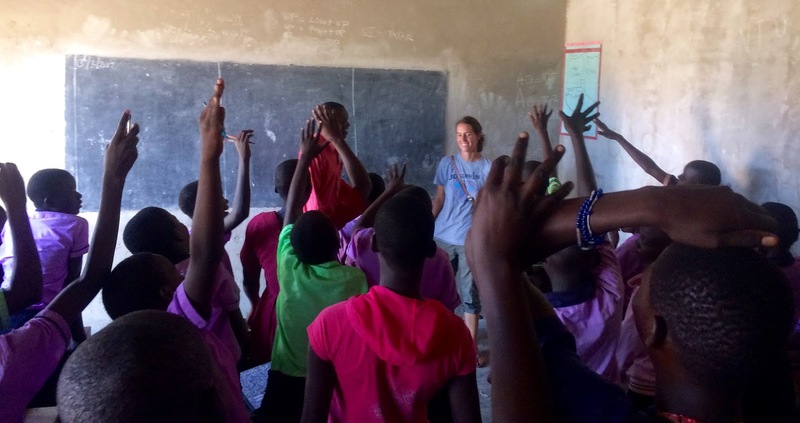 There is such a huge need for this and a hunger for the word of God but it has been challenging to recruit volunteers to help teach in all of the schools desiring purity clubs. 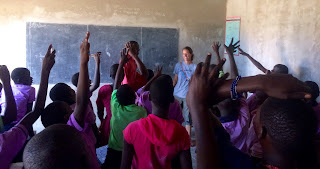 Please pray with us that the Lord would send out more workers, more Ugandans who are willing to live a life of purity and also teach about it in schools. This past weekend we were able to meet with the students in our sponsorship program to give them school books. We are happy for the partnerships that we have formed in town. One of the local Indian-run supermarkets donated a box of notebooks and a book shop gave us pens at a discounted price. This helps us a lot as we are able to then even give books to kids who are still waiting to be sponsored. Also we checked on our student Henry who is in his third year of training for construction. 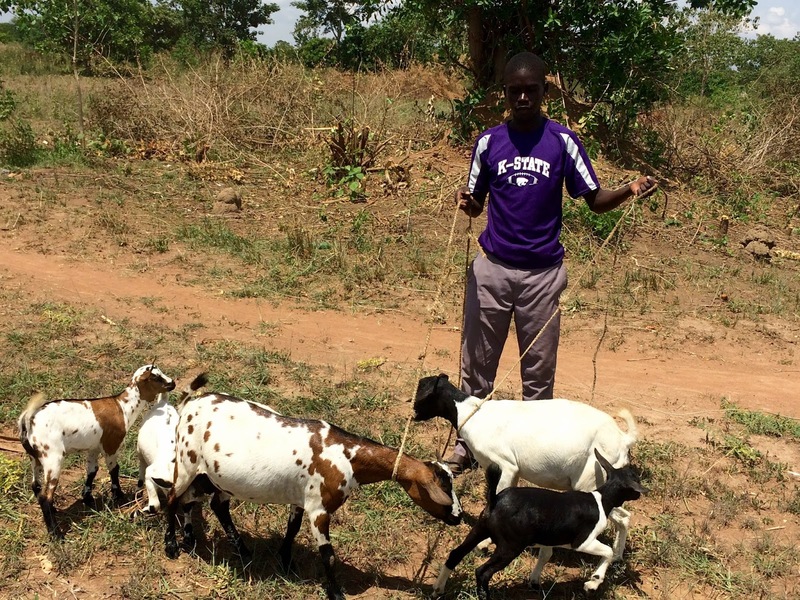 He was given a goat by his sponsor 2.5 years ago and they have now multiplied to 5. 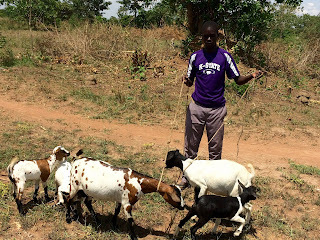 Soon he will be able to get a cow with some of these goats. We are proud of him for taking good care of them even while also being in school full time. This is so encouraging for us and him. ​The Men’s fellowship seems to be a big hit and the number of attendees keeps increasing each week. We can’t wait to see the impact of this fellowship in the lives of the men and their families in Soroti. On a sad note, our faithful dog Muffin died. We don’t know the cause, possibly poisoned, but it was a big surprise. She was both friendly and tough. She always kept guard at night for us and warned us of anyone walking by. 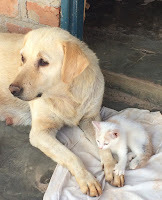 We had just gotten a new kitten and she tolerated her so well. She had been with us about 3 and a half years but was older than that as we inherited her from another missionary family. Construction on our house is coming a long. We hope to put the roof up over this next month.We are already praying through the house inviting the presence of God, declaring it a place of refuge, of new life, peace and joy in the Lord. ​Last but not least, if anyone would like to join a small group that is planning to come on a short term trip in October let us know and we will give you more details. The dates are from the 6th of October to the 18th. The tentative plan for this group is training different groups in soap-making, farming God's way, and jewellery making to help provide people with income generating activities. There are also opportunities for playing with kids and encouraging them, helping them with school work and sharing in purity clubs, and also to see what God is doing in Soroti. Also please keep praying for Soroti. There is still a drought and people are hungry. Pray for rain. Pray for multiplication of food and seed.